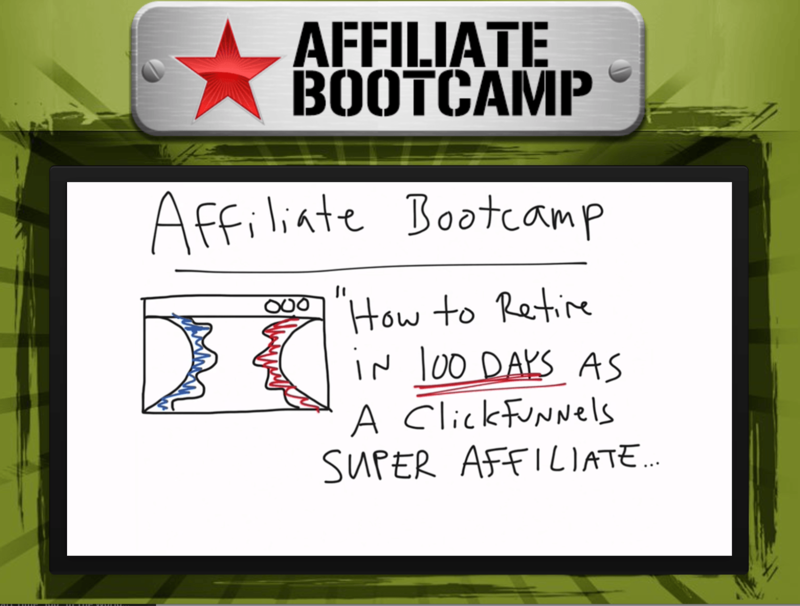 ClickFunnels Affiliate BootCamp – 100 Day Challenge – 3rd Update | Checking For A Scam, So You Don't Have To. After, the 2nd update we are really getting into this program. Were going to go over this update and you will find yourself farther than you most likely have ever been. I just want to remind you if you haven’t made money yet don’t worry, as Russell says sometimes you have to change things so they are just right. There might be just one part of your funnel that need a bit of work. Let’s dig into this update and see if we can get some money in your pocket. If you, are part of a different program as well as going through the Bootcamp use them together. Russell gives you a lot to think about and ways to get it done. Sign Up, Create Affiliate Account And Get Your Links – Very important you have to have the affiliate account so you can have your links to make money. Learn Secret Formula & Create Your Dream Customer Profile – Right out of the gate we started with one of the most important things. You need to know who your dream customer is, so you can market to them. Where are you going to bring them and how are you going to show them value. Developed Your Attractive Character (Elements, Identity & Stories) – This is where we learned how to develop a character that is intriguing, interesting, and funny. You build this character so people want to open your emails they want to spend with you. Learned How To Spend More Than Your Competition (Profitably) – Once you understand where your break even point is then you know everything after that is profit. Once you know your break even point then you can decide how far to push it, you can get more ads and still break even. Learn There Value Of Traffic You Can Control & How To Get It – We learned the value of traffic and how to take traffic you control and turn it into traffic you own. Once you own that traffic its part of your community and that is where the real money comes from. 7 Phases Of A Lead & Apply There 100 Visitor Test – You have your funnel and you decided on your front end offer. With the 100 visitor test you were able to figure out how to ascend your customers through the rest of the funnel. Created Your First Affiliate Front-End Funnel! (DotCom Serects Book) – We created our first front end funnels using DotCom secrets book and using the 100 visitor test. Created Facebook Ad(s) For Your Affiliate Funnel – Put together our first Facebook ads to target the traffic we can control. Then take the traffic we control and turn it into traffic we own. Created Your First Automated Email Campaign (Soap Opera Sequence) – This step really helps you connect with your audience from your Facebook ads. It Let’s you be able to relate to the traffic you own. They are trying to solve a problem and you use your soap opera sequence to solve it for them. To Determine Your Funnel Metrics – This is a very important part this step tells you if your funnel is healthy. It will tell you if you are going to make money or continue to lose money. If you, do have a funnel that is losing money this formula will show you how to fix it. To the point where you will at least break even on the front end. Learned & Applied Russell’s Traffic Scripts (Enquirer & WWWH) – Learned how to grab that cold traffic with the gripping headlines. We also learned the Who? What? Why? How? These are the questions we need to know the answers too. Congratulations you have made it past day 10 and you have learned how to build your first funnel. Most people don’t get this far so you should be very proud of yourselves. This is the first real step you have taken on the road to your affiliate business. You made it to be able to create that first attractive buying funnel. Now were off and running and now things are about to get really exciting. Now its about the ads and the fact that the ads are only going to work for so long. Then people get tired of seeing the same ads over and over. At some point you have to change the ads changing them up will shake things up and keep people interested. But your funnel is done you can improve on it if you would like but for all intense purpose your funnel is done. You should be proud of the fact that you have gotten this far. Today is going to set you up for the next 5 days. Now have a funnel to market to a cold audience. Now we market to your community / list. Build out your ongoing Email marketing campaign based on that message. After you finish the video for today, you will have 2 bonus videos to watch they will help speed up your success. I have a feeling tat there are some people out there that have watched Seinfeld. You could have watched them when they were first run or there are reruns on all the time. Anyway, Seinfeld was a show about nothing, it was just kinda the day in the life of the characters. Lets just say you don’t have to watch every episode, you won’t get lost. That’s what this email sequence is, about nothing. I know your saying what? I will explain. Russell explains that most people actually under email their list. When he started he emailed once a month, then he was told that’s too little so he went to twice. Everytime he emailed more his income doubled now he emails every day. He knows people that email up to six times a day. There is a strategy to this, when you are emailing they are basically about nothing but they are pointing to one of the offers. What you write about is up to you something that happened in your life that day remember its about nothing. Well there is kind of a catch, no matter what you write about you have to tie it into one of your offers. You can talk about how at the gas station today there was this lady that drove off with the fill still in her car. Story about nothing, you just have to tie it back to your offer. Like I went to the store today because they sell this juice I really like. Its just veggies freshly juiced and put in the bottle so I bought 10 of them they cost $7 a bottle so I spent $70 on juice. Now this is not a brag letter, I am only able to do this because I work online I don’t worry about bills. If you would like to get a second income click on the red button. See tie it back to the offer, the Seinfeld emails are useless unless you tie them into your offers. What we are going to do is add a pixel to our Facebook ad page. The reason for this, there are a couple so Let’s get into them. To track by conversations in Facebook. The bridge funnel is a cloned funnel that will direct your visitors to your video walk through page. This is usually used when your not using a sales page. It will somewhat explain why you have to optin more than once. This should appear in your saved funnels in ClickFunnels. The bridge page has some value on it, it is where your video is and says watch this short video then click here. There is an optin button and directions to get an email after you view the video. There is also a walk through to show you how to set up the cloned page. This will be easy to follow he tells you what to do as he is showing you how to do it. This is the script that Russell uses for every sale. Its very easy to do and once you are done watching the short video about it your going to say, well that was easy. If you answer these four questions it will present the product and give the visitor all the information they need. Who – Who are you. What – What are you selling. Why – Why do they need it. How – How do they get it. The mistake most people make is they make a 20-minute sales video to sell a free plus shipping item. Its just overkill you just need to answer the 4 questions. Catch – So you address the catch question, everyone wants to know what’s the catch. Urgency – Make it a sense of urgency, why do they need to act fast. Guarantee – You need to put your what your guarantee is. Re-Cap – You just go over the things we just talked about. This of course is the best traffic there is, this is traffic that may not be a hot buyer. But, they know you, they have maybe bought something from you but they are on your list. The idea of this lesson is to take traffic you control and turn it into traffic you own. This way you can take the traffic you own and send that traffic to the offer you choose. Here you have it the 3rd update in the series, I hope you are following along. Remember these tips can be used for your funnels of course, but you can also use this for your website ads. There is a ton of good useful information in this series, I have learned so much since starting this 100 Day Challenge and I hope you are too. Thanks for reading this post if you have any questions or comments please leave them below.